AS THE UMBRELLA ENTITY over leading commercial vehicle brands MAN, Scania, Volkswagen Caminhões e Ônibus and RIO, Volkswagen Truck & Bus – currently Volkswagen Truck & Bus AG after an entry into the Commercial Register of the Munich District Court - will eventually be known as the Traton Group (pronounced ‘Tray-ton’) it’s reported recently. 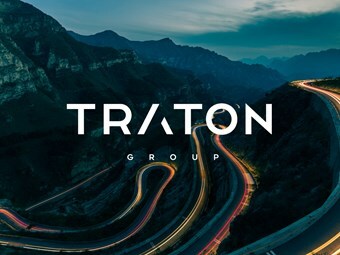 The former VW Truck and Bus Group - encompassing brands such as MAN, Scania and Volkswagen - will be known as the Traton Group. According to the company, this new branding is another milestone on the Group’s way to increase independence even further and towards capital market readiness. Andreas Renschler, CEO Volkswagen Truck & Bus Group and member of the Board of Management of Volkswagen AG, said: "The new name Traton is a major milestone on our road to become global champion of the transportation industry. Since our foundation, we have grown together faster than expected. Traton provides us with more independence. It will further strengthen our group’s joint identity and uniqueness. The new name will also foster our visibility as the leading group for innovative transportation solutions. It will increase our attractiveness for new talents as well as for capital markets." * TRAnsformation of the ecosystem - transport is its mission, for everyone´s benefit. * TRAnsportation is its and its customers’ passion. * TONnage is what its customers are moving around the world, every day. * TRAdition of its strong brands is what is grounding it. * Always ‘ON’ is the ultimate goal of its customers and its attitude in order to make everything possible for them, it’s stated. Traton’s joint values include: determination, integrity, respect, customer focus and team spirit. The strong, traditional brands MAN, Scania, Volkswagen Caminhões e Ônibus and RIO will retain their own identities under the umbrella brand of Traton Group, it’s affirmed. The official name change was expected to be effective by Q3 2018. As the company explains, the transportation sector is facing major changes due to increasing transportation volumes, higher emission standards and customer demand for efficient, sustainable and competitive solutions. Traton combines the agility and spirit of a start-up with the extensive experience of traditional brands. With this unique set-up, the group is perfectly positioned to re-invent transportation for future generations, it says. Hans-Dieter Pötsch, head of Volkswagen AG’s and Volkswagen Truck & Bus’ Supervisory Boards, said: "The Supervisory Board fully supports the ambitious plans of Volkswagen Truck & Bus and the Group’s move towards a unique identity. This will reinforce our truck [and bus] business on their way to capital market readiness." Part of the imminent new Traton entity, MAN Truck & Bus reported a record order in June 2018, the company reports. Between 2019 and 2022, the company is set to supply up to 1,000 of its new Lion’s City and Lion’s Intercity buses to 31 regional bus companies of DB Regio AG in Germany. The cooperation initiative also includes framework agreements for optional service agreements and for supplying spare parts. DB Regio is Germany’s biggest operator of buses and a long-standing customer of MAN Truck & Bus. MAN’s newly developed generation of buses boasts enhanced efficiency, comfort, and an ergonomic design and already complies with the Euro 6d emission standard, which will enter into force on September 1, 2019, it’s stated. Additionally, 61 hybrid Lion’s City buses are set to be operating on the roads of the Polish capital of Warsaw in future. Thanks to the buses’ modern electric engine, each vehicle can save up to 30 per cent of fuel. The buses will be put into service by Mobilis, Poland’s biggest bus operator, it’s stated. A major order for over 1,000 coach chassis was received jointly by Volkswagen Caminhões e Ônibus and MAN Truck & Bus in Mexico and is testament to how exceptionally well the brands are working together within the Group, it’s claimed. In April 2018, this specialist for emerging markets received an order for 3,400 school buses, to be supplied over a period of twelve months as part of Brazil’s school bus program. The vehicles will be used by municipalities and regions across the whole of Brazil, it’s stated. Boasting 25 years of experience in the production of buses in Brazil and a range of 17 different chassis, Volkswagen Caminhões e Ônibus is one of South America’s leading bus manufacturers and has once again defended its number one position in the Brazilian truck market, the company says. Earlier in the first quarter of the year, Volkswagen Caminhões e Ônibus won the prestigious Lotus Award of the Brazilian industry in several categories and was crowned Brand of the Year for light-, medium-, and heavy-duty trucks.